Phyl Lobl is a singer - songwriter - teacher who has been active as a performer at Folk Festivals, mainly in Australia, since just before the first National Folk Festival 1967. She thinks of herself as a Cultural Maintenance Worker who documents the Australian Experience through folklore. As is said in the folklore world, some of her songs have 'entered the tradition', some have been recorded here and overseas, some have been used by authors to illustrate their work which makes them useful. She fought for recognition for Australian Folk music on the Music Board of the Australia Council, for this the Folk Community presented her the Graham Squance Memorial Award in 1986. Performing has only been a part of her creative contribution. Innovative teaching was another. A music teaching kit 'NOT JUST NOISE' was published in 1987. Since then she has refined and improved this method of instruction. Programs in other areas of primary education will, in time, be included on this site. If you use the material and want to show some appreciation you could make a donation to any organisation that assists the indigenous people of Australia. This website could interest singers of folksongs, folklorists, music teachers, primary school teachers, Australian history teachers and teachers of Australian literature. This website is a work in progress. Material will be added periodically. 'SINGING THE SOUTH - a Songline-Timeline Of The Illawarra'. 'SINGING THE SOUTH' - a 'Songline Timeline of the Illawarra' presented in the form of a CD and a songbook. Grown from a library-based writing program and supported by Kiama Council in 'concert form' the material was almost all written in 2009. All lyrics and tunes are Phyl Lobl compositions except the tune for 'Daisy' which is a parody of a song by Harry Dacre. Singers on the CD are Phyl Lobl, Shayna Stewart, John Broomhall, Alan Morrison, and cameo guest Margret RoadKnight. Instrumentalists are Michael Roberts, Christine Wheeler, George Washingmachine, Stuart Leslie. The CD was arranged and produced by Michael Roberts of Musycks Productions Tempe. The book was printed by 'Creative Visions'. Payments can be made online. BOOK - Words & Notation. $25 which includes postage. CD - $15 which includes postage. Order for both CD + BOOK $30 which includes postage. BOOK - Words and Notation $30 which includes postage. CD - $20 which includes postage. Order for both BOOK + CD $35 which includes postage. Please contact me for sales or any enquiries. 'A Bright Progressive Band' they were called. 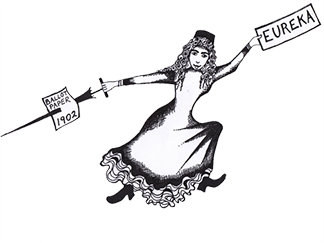 DAMES & DAREDEVILS FOR DEMOCRACY is a presentation that charts the development of Women's Suffrage in Australia through ten strategies & featuring ten prominent Australian suffragists. The progress is marked by their lives, their actions, their artistic products and by songs. Created by Phyl Lobl, the production shows just what 'grand dames and daredevils' they were. They took us from the Hat Box to the Ballot Box and then helped women in England and America get there too. They were daring, resilient, intelligent and compassionate yet very few Australians know their names. © Copyright remains with Phyl Lobl and acknowledgement of the source of the material where ever it is used would be appreciated.